SIDMA College UNITAR Sabah in its effort to promote a creative environment to help younger generation towards engaging in abstract and analytical thinking, sharpen their visual-spatial acuity, and be more receptive to out-of-the-box thinking so they will be able to produce high degrees of autonomy and able to demonstrate self-discipline in matters regarding work; have encouraged its students to express their thoughts and feelings through drawings, in related assignments, projects and more. Recently when UNITAR International University, Petaling Jaya, Selangor Darul Ehsan launched the Imagine #URFUTURE Poster Design Competition 2019, UNITAR Sabah extended the competition to secondary schools students in and around the college community such as Kota Kinabalu, Penampang and Papar; with the main aim to complement the advancement of creativity in education for secondary school students thus encouraging the shifting towards the increased acceptance of valuing creativity for all learners. Puan Azlina Ngatimin, Director, Corporate Marketing and Business Development SIDMA College, together with her team in collaboration with the respective school management encouraged secondary schools students to participate in the event. She was glad to note that the schools sent in 21 teams to participate in the Semi Final Competition, which was held at SIDMA College UNITAR Sabah on 9 April 2019. Among some the schools that participated in the competition were: SMK Kinarut, Papar; SMK Perempuan, Likas; SMK Tansau, Penampang; SMK Likas, Kota Kinabalu; SMK Bahang, Penampang; SM St Francis Convent, Kota Kinabalu; and SMK Datuk Peter Mojuntin, Penampang. Madam Azizah Khalid Merican, CEO SIDMA College UNITAR Sabah, during the closing and prize presentation ceremony, congratulated the students for their willingness to participate in the event. She added that through such art activities, students not only learn about the proper use of the tools (brushes, paints, papers, etc) but they are able to master the art techniques appropriate for their level of maturity, as well as their ability to develop persistence and creativity. In addition, their respective completed work brings them an enormous sense of joy and satisfaction. Madam Azizah also took the opportunity to thank the respective school principals for their collaborative and cooperative effort in sending students to participate in this SIDMA’s first ever poster drawing competition for secondary schools students; despite the fact that it was held during a normal school day, and the schools have to ferry their students to the competition venue using the school expenses. The CEO congratulated participants from Sekolah Pendidikan Khas SMK Datuk Peter Mojuntin, Penampang for being selected as the overall winners of the Sabah’s 2019 “Imagine #URFUTURE Poster Design Competition. First runner-up went to participants from SMK Perempuan Likas, whereas the third place went to participants from SMK Datuk Peter Mojuntin, Penampang. She too thanked Mr Charles Mawan Bernard for his contribution to be the judge to competition. The winning overall winner received RM1, 000 in cash; 1st runner-up RM750 and the 2nd runner-up received RM500. Madam Azizah was given the honour to present the prizes to the winning teams. 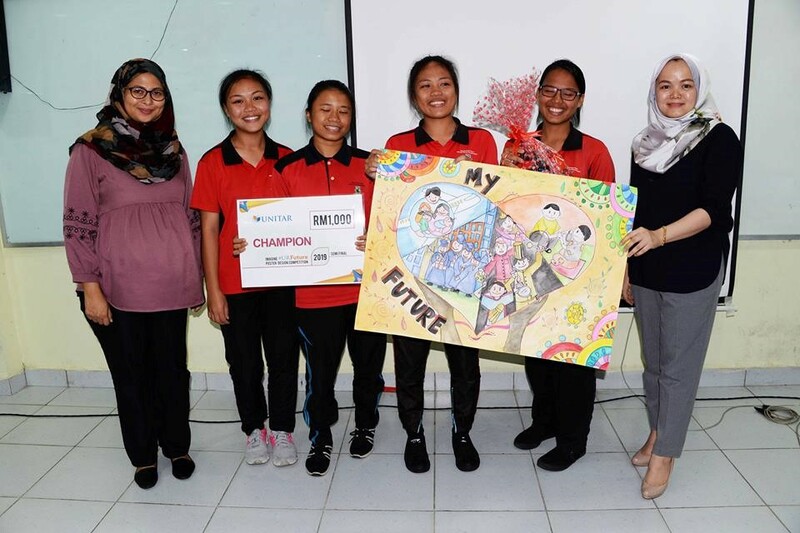 Madam Azizah also announced that the overall winner team from Sekolah Pendidikan Khas SMK Datuk Peter Mojuntin, Penampang will represent Sabah during the Final “Imagine #URFUTURE Poster Drawing Competition” to be held at UNITAR International University, Petaling Jaya on 27th April 2019. 4. Consolation Prizes: Nine (9) consolation prizes of RM 1,500 cash and RM 50 Book Voucher will be awarded to the successful teams. This entry was posted on Thursday, April 11th, 2019 at 6:41 pm	and is filed under SIDMA College City Campus, Kota Kinabalu.. You can follow any responses to this entry through the RSS 2.0 feed. Both comments and pings are currently closed.